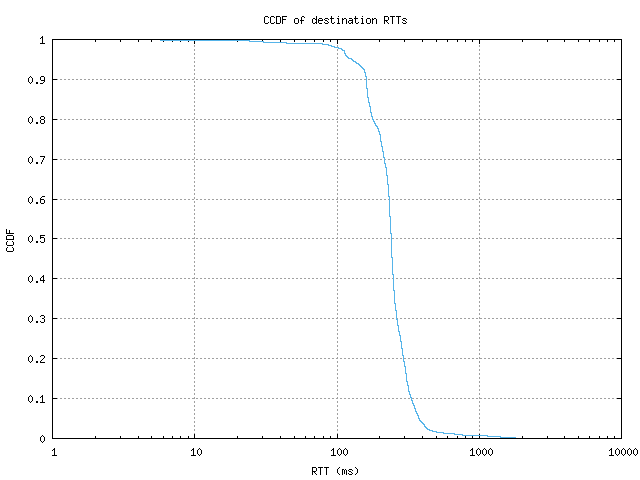 This graph shows the complementary cumulative distribution function (CCDF) of round-trip times (RTTs) to the destination host. By showing the distribution of RTT values to all responding destinations, we can get a sense of how varied the speeds are for connecting to different points in the Internet. The complementary cumulative distribution function shows the fraction of collected data points that are greater than a given value. This is backwards from how percentiles are given, as those show the percentage lower than a given value. On this graph, you would find the 80th percentile at the 0.2 Y value. The round trip time of a probe is the time (in milliseconds) that it takes for a packet to be sent from an Ark monitor to a destination and for that destination's response to be received by the monitor. Therefore, no RTT values are recorded when a probe does not reach a destination. When the CCDF graph has a nearly vertical dropoff point, that indicates that RTT values fall within a narrow range. This tends to mean that a bottleneck exists within the monitor's connectivity that dominates over individual destination path variation. A more gradual curve, on the other hand, indicates greater variability in the response times of destinations, which tends to scale directly with the path length distribution.